It’s been over two weeks since our April Fools post…and we have some news. Today you can purchase a set of two eeros that actually comes with a decorative log slice. They say that there’s some truth in jest, and once we figured out that we could include a log slice with eero, we decided to make it happen. So if you have #WiFiProblems, head to Amazon to get a set of 2 eeros with a log slice for $349. Since our launch in February, we’ve loved seeing the photos of #eeroathome across America. Many of you delicately posed your systems on a bookshelf, table, or desk. Sometimes, though, you want just a bit more panache. 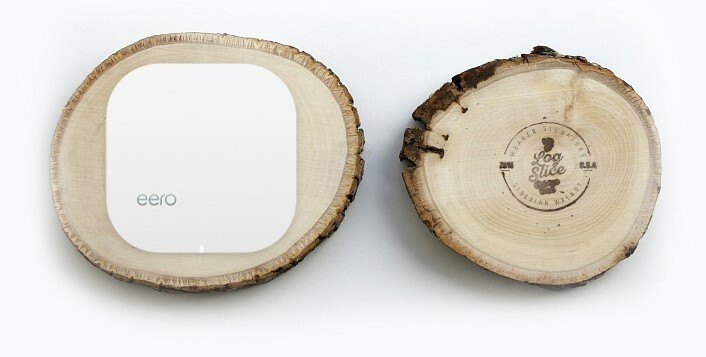 With that in mind, we’re excited to announce the eero Log Slice. Nature’s beauty is the catalyst for innovation, so it’s only natural that the wise lines and intricate detailing in its bark provide the perfect resting spot for your eero WiFi system. Hand carved by arbor artisans in Glenfair, Portland, and finished in the open workspace of a local craft wood shop-slash-brewery in Berkeley, California, the Log Slice says “I want better technology, but I am grounded.” While you love to stream documentaries on tiny homes with ease indoors, you feel a deep connection to the outdoors. There’s simply no better way to put your WiFi on a pedestal — while also making your family and friends jealous. Finally, your technology can match the aesthetic of the rest of your lifestyle. Pre-order your Log Slice today! 3-packs are, of course, available.